A large number of Factory Obscura artists showed up for the artist collective’s public volunteer nights. 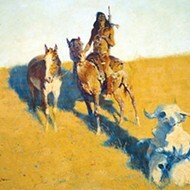 A multitalented artist is currently seeking a home in Oklahoma City. She has many parents who continue to nurture her, and she overflows with creativity, artistic skill and diplomacy. She excels in networking, logistics and politics. One thing is for sure: She never meets a stranger. If the collaborative art group Factory Obscura could be personified as one person, this is how cofounders and husband and wife Laura and Laurent Massenat would describe it. “It takes a lot of different kinds of people coming together to create these exhibits,” Laura said of the group’s first exhibit, Shift and its latest, Beyond, which will run Sept. 22-Dec. 21 at 1522 S. Robinson Ave. 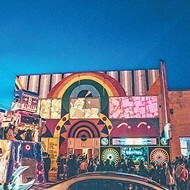 Beyond, the group’s artists said, will turn their temporary studio (which used to be a tire shop), into an immersive artistic experience where visitors will be engulfed by themes of darkness, space and mystery handcrafted by local artists and community volunteers. If the idea sounds foreign, Laurent said that’s because it is. 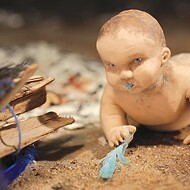 There are only a handful of art collective experiences in the nation, and Factory Obscura is the first of its kind in Oklahoma. 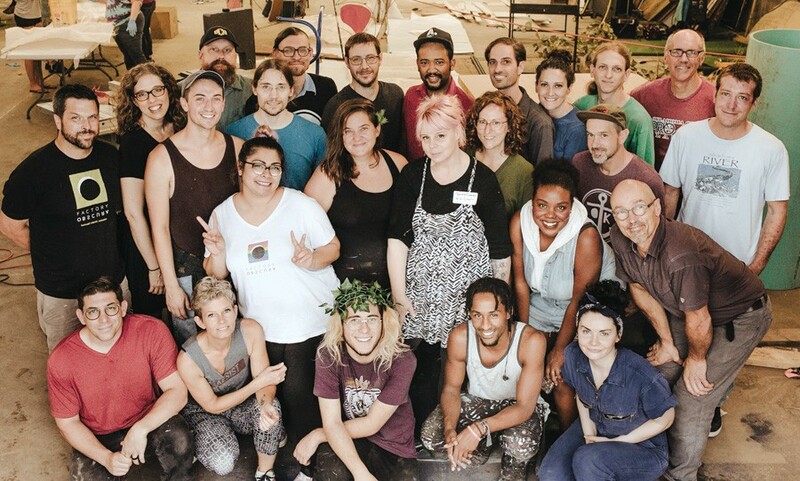 With inspiration from their yoga instructor Thomas Thompson, Laura and Laurent initiated the creation of Factory Obscura in early 2017 after visiting highly acclaimed City Museum in St. Louis. Laura was born and raised in Oklahoma and met Laurent, who was born and raised in France, while the two were studying at University of Oklahoma in 1991. Laura was working on a degree in education and studying French while Laurent was a foreign exchange student studying engineering. The two married and lived for a few years in France before returning to Oklahoma. 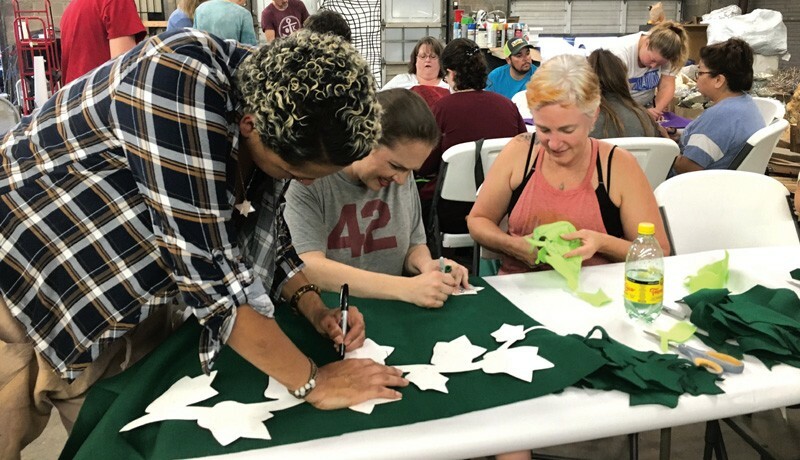 from left Factory Obscura volunteers Kaalen O’Bannon, Alena Snyder and Kaylyn Cavett work together to create felt art leaves. “The belief that you can do anything and the reality that you really can … that’s very American,” Laura said. The couple returned to Oklahoma for the same reasons Laura’s ancestors settled in the state in late 19th century: They saw potential. The couple admitted that settling down in the Sooner state was an idea that took some getting used to. The couple went on to buy a home in Mesta Park, have four children and invest in their community. Laurent started the OKC-based engineering firm Obelisk Engineering, Laura joined her children’s school board and together the couple co-founded Elemental Coffee Roasters in 2011 and then Factory Obscura in 2017. Factory Obscura, Laurent said, is a way to offer Oklahomans bon vivant, French for a social and lively way of enjoying life. It’s also a way to support the art community in Oklahoma by employing local artists and a way to strengthen the community at large by encouraging volunteers to help artists create exhibit features. Five founders, including the Massenats and Karper, collaborate to produce exhibits created by over three dozen artists and designers. Additional founders include Tammy Greenman and Hugh Meade. While the artists are paid on a contractual basis for now, Karper hopes to offer salary and full-time employment in the future. The first step toward that model, Karper said, is to eliminate the notion of being a nonprofit organization. Karper helped Factory Obscura become what is known as a “B corporation,” or one that is for profit but also contributes to the community at large. 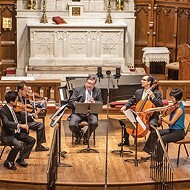 The company’s status is helping pave the way for its artists to earn decent wages while also contributing to charities of their choice. 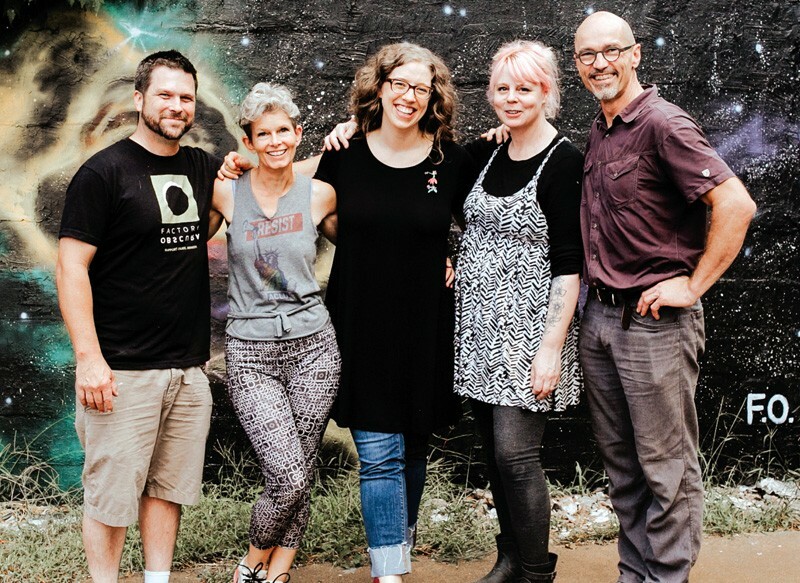 from left Hugh Meade, Laura Massenat, Kelsey Karper, Tammy Greenman and Laurent Massenat are the founders of Factory Obscura. After Shift, Factory Obscura was able to donate $1 thousand to an art mentorship program for Oklahoma City high school students. 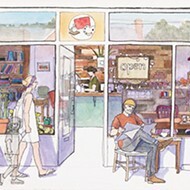 This year, they hope to create a mobile art experience for younger children who attend Oklahoma City public schools. Homeschool moms Alena Snyder, Kaylyn Cavett and Kaalen O’Bannon take their children to volunteer at Factory Obscura because they believe in the power of art as well. One rainy weekday night about two weeks before Beyond’s opening night, however, the moms gathered at Factory Obscura to busy their hands while their kids finished schoolwork at home. Karper said she has seen volunteers from all walks of life enter the doors of Factory Obscura. Homeschool parents and their children, aspiring artists, professionals who work downtown and motorcycle bike groups have all lent a hand to the art projects that will be a part of Beyond. Founders are searching for investors and a permanent home for Factory Obscura, Karper said. While Shift was free to attend with donations encouraged, a $10 admission fee is required to attend Beyond. There are four doors to the exhibit, Karper said, with each door providing visitors a different path and experience. Season passes can also be purchased for $25. 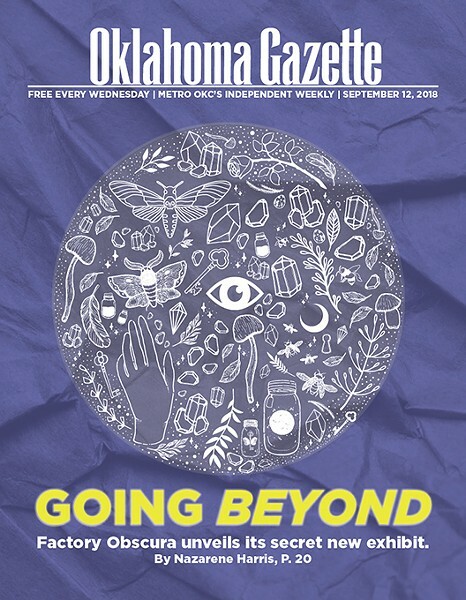 Editor’s note: Oklahoma Gazette graphic designer Tiffany McKnight is a member of Factory Obscura.